Hilarious, must have cat themed doormat. Cat welcome mat reads "Visitors Must Be Approved By The Cat." Funny welcome mat perfect for all dog lovers! Dog doormat reads Missing: Husband, Dog and Fishing Pole. Reward for Dog Available in 18 x 27 size. Funny dog welcome mat featuring the caption "Cleanliness is Next to... Impossible." This outside doormat is made of 100% Olefin natural fibers. Size 18 x 27. Great gift idea for the dog lover AND drinking connoisseur in your life! Funny dog door mat reads "It isn't really drinking alone... if your dog is at home." 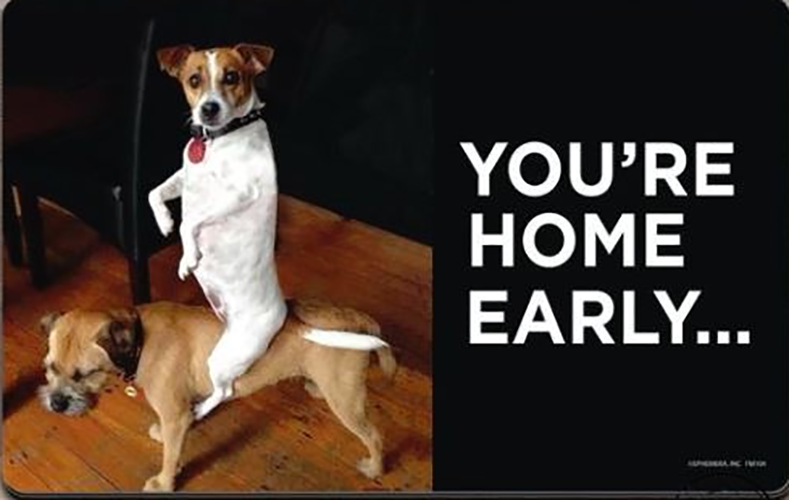 "Just so you know, everyday is hump day for our dog." This funny dog doormat is a hilarious gift idea for your loved ones! "Welcome Diversity." This funny dog doormat features dogs of every size and type and would be a great addition to any dog lovers collection. Hilarious high cotton doormat is durable enough to be used indoors and outdoors. This funny dog welcome mat reads "The best therapist has fur and four legs." Buy this perfect dog lover gift today! Purchase this funny welcome mat for your next holiday! This doormat reads "You're Home Early" and is used for indoor or covered porch use! Economical cat lady gift! This cat welcome mat is 18 x 27 and is durable enough to use in and outdoors. Buy this great cat themed gift today! Hilarious pet theme doormat "We like big mutts and we cannot lie." Make your visitors laugh before they even enter your home! These doormats are 18" x 27" and are made from 100% Olefin. Makes a great gift low price with standard shipping. Great gift idea for dog and cat lovers! 18 inch x 27 inch funny doormat reads "Peace, Love & Muddy Paws." These doormats are 18" x 27" and are made from 100% Olefin with perfect bound stitched edges and printed with color-fast inks. Dog themed doormat featuring the text "Shed Happens." Have a dog who is shedding constantly? You NEED this funny dog doormat! Makes a great gift too. Funny welcome mat for animal lovers. "It's all fun and games until someone ends up in a cone." A Shelter Dog Rescued this Family welcome mat. Order today and make everyone smile before they enter your home! This Olefin entry mat is a great dog gift idea. Keep this in mind for all the pet owners you know! Hilarious 18" x 27" dog diary welcome mat is made with 100% Olefin and color-fast inks, so this mat will last for years to come. Pet lovers will enjoy this humorous welcome mat. This mat makes a great gift for any dog owner. Funny cat humor welcome mats. This olefin mat is perfect for all cat lovers. If cats could keep a diary, this mat portrays what they would say. A perfect gift for cat lovers! Dog lovers NEED this funny welcome mat. Caption "Warning: Dog Has No Respect For Personal Space." These humorous welcome mats by High Cotton will have all of your visitors laughing when they see this doormat. These funny doormats will make your guests laugh out loud. Order today and see for yourself! This humorous welcome mat will have all dog lovers laughing. 100% olefin mat is high quality so you can entertain your visitors for years to come. A funny door mat by High Cotton Inc. makes a great gift for a pet owner. This olefin mat is durably constructed with olefin yarn and printed with colorfast inks for ultimate outdoor or indoor longevity. This mat will entertain all of your guests and will last for years to come. High quality mat is a great choice with our low cost shipping! If you're crazy about shoes then this welcome mat is just for you. Mat is made from 100% Olefin with perfect bound stitched edges and printed with color-fast inks.